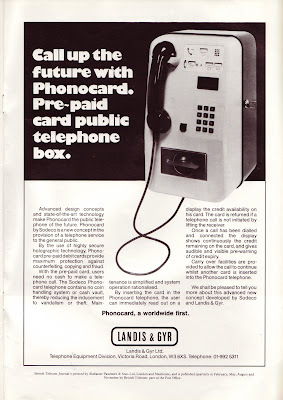 Card phones based on Landis & Gyr optical phone cards were trialled in Britain from 1981, they lasted until 1996 (from to Ian Jutting article THG journal 102) , when they were replaced by the chipped or smart card phone cards. These pages record my investigations into the technical detail, engineering practice and social history of the optical phone card in Britain. What's new about payphones ? Have you ever walked into a public payphone only to find there are no 5p or 10p coins in your pocket or handbag? Or found a foreign coin (or even a mutilated British one) jammed in the slot? Or discovered that the whole system has been vandalised during an attempt by petty thieves to make off with the coin box ? On display at the ideal home exhibition this year, and attracting a lot of attention, was our new entry in the Payphone range the Cardphone, which could help to overcome these sorts of problems. About 200 of these press-button Cardphones are currently on trial in London, Birmingham,Manchester and Glasgow, in busy places like airports, main-line railway stations and city centres. Sited near ordinary Payphones, to give our customers a choice, they are suitable for inland and all overseas calls currently available on IDD. and size to a credit card. 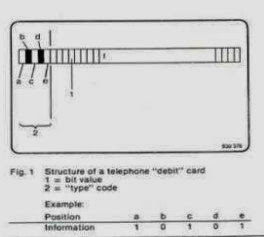 these cards are coded with units which are erased by a thermal process when the card is inserted into the Cardphone to pay for calls. Incorporating the new holographic technology - based on special patters of light - the cards have a high level of security against fraud or forgery. the card units are valued at 5p and there will be two values of card available, one of the 40 units at £2, and 200 unit card at £10 which is double sided. They enable us to make savings by removing the need for regular visits to collect or clear jammed coins. Cardphones are also easier to use and because they are microprocessor controlled they can be programmed to enable calls to certain numbers - such as 999 emergency calls - to be made without a card. , and this figure decreases as the call proceeds. When the units on the phonecard are nearly all used, the visual display starts to flash and the caller hears a warning tone in the handset. The customer can then use up the remaining units; the call is automatically cut off a few seconds after it has all run out, and the spent phone card ejected. Alternatively the caller can continue talking by pressing a special button on the front of the Cardphone. This automatically erases the remaining units from the card, stores the value in an electronic memory, ejects the card and allows the caller to insert another card ( or the second side of the double-sided 200 unit card). When the handset is replaced, charging for the call stops immediately and the card is returned after a few seconds. During the trial it is proposed to make the cards available from various places in the areas where the Cardphones are installed. These will include newsagents and tobacconists as well as Telephone shops and Post offices. 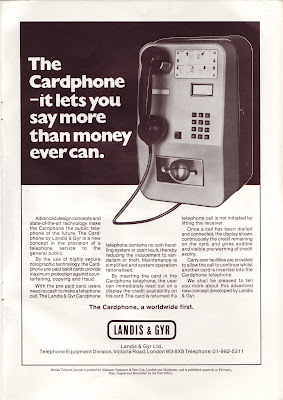 If these trials show the Cardphone to be popular we will consider the possibility of installing more in town locations,so brining the cashless society one step closer. The BT website says The first cashless, card-operated payphone - the Cardphone - was introduced as a new service and to combat damage caused by vandals attempting to break into payphone coinboxes. 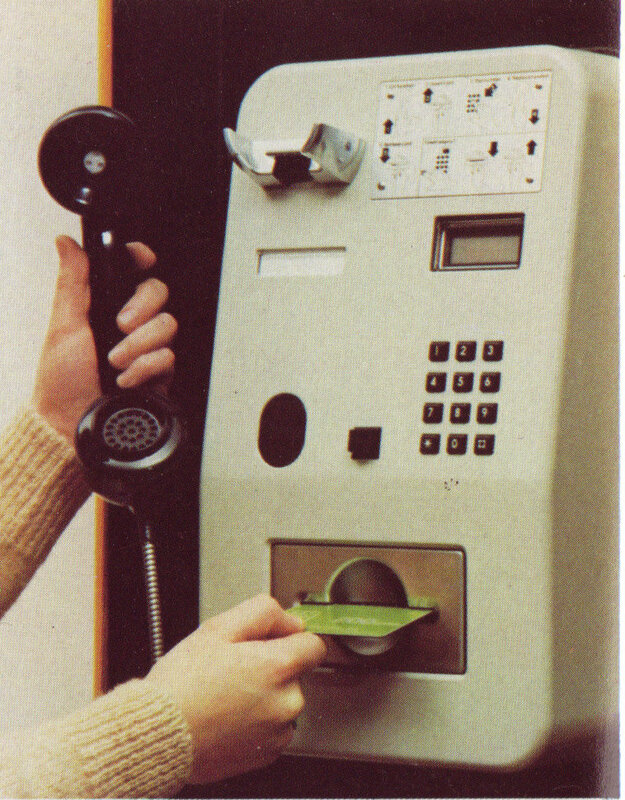 The 10, 20, 40, 100 or 200 unit Phonecard was inserted in the payphone and the call made in the usual way, with the charge for the call erased from the phonecard until the units were exhausted. There are excellent technical articles form Landis & Gyr here .. The above article says there are upto 120 bits stored per track, ie 240 bits on a reversible card. Every (value?) bit on the card is encoded with a holographic family code, which the reader rejects if its not the correct family code. It looks like each family code has a different hologram( or structure, eg STU7 for uk cards), light is projected onto the correct bit on the card, two light sensors at different angles measure how much light I reflected. If the light levels match the correct family code the bit is counted as valid. Some of the type bits are erased when the card is exhausted, presumably this makes reading the value of an empty card quicker ? bits are erased by applying heat to the front of the card until the family code stops being read by the sensors thus proving erase has been successful. Says that a card track has 1 Sync bit, 7 type bits and 120 value bits - a total of 128 bits per track. 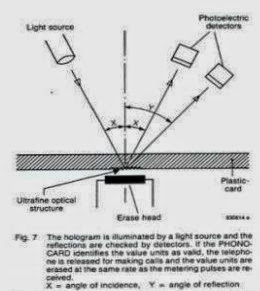 "To check the validity of the information carries by the value units, they are illuminated by a beam of infra read radiation. This is reflected at certain angles depending on the chosen micro structure and checked by appropriate detectors." I've taken close up of the type bits on different cards.. There is a lot of possibly unnecessary maths in this article.